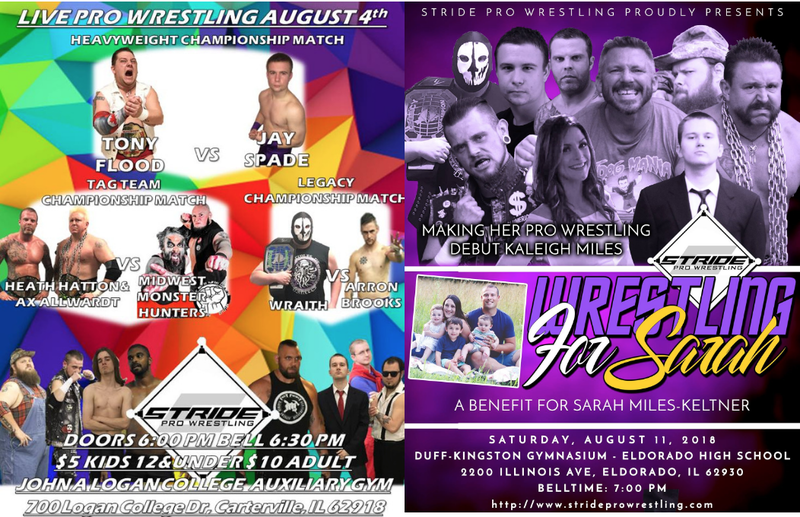 Not only does Stride Pro Wrestling return tonight but there will be a second great show coming up in seven days. Stride's show tonight has been well documented here on the blog as well as the Stride Pro Wrestling Facebook page. Three championships will be defended at John A. Logan College in Carterville. 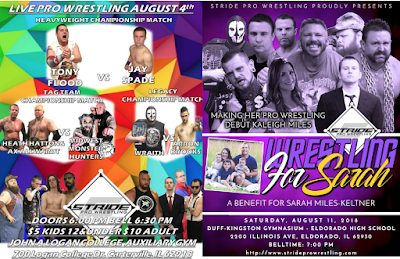 Bell time is 6:30 p.m.
Then on Saturday, Aug. 11 a HUGE fundraiser is underway. 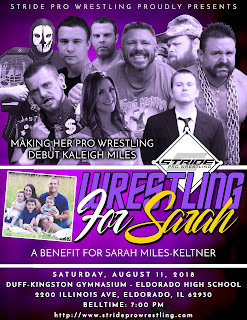 The men and women of Stride Pro Wrestling are coming together to help raise money for the family of Sarah Miles-Keltner. The young mother of three is battling stage 4 cancer right now. Every penny raised that night will be donated to the family for medical and personal expenses. Sarah's sister-in-law Kaleigh Miles has been training and will be stepping in the ring that night too. Her opponent will be named soon. This show is being held at Duff-Kingston Gymnasium at Eldorado High School. Bell time is 30 minutes later than usual at 7 p.m. Your favorites are scheduled to be there and the card will be announced next week. We hope to see you at both of these amazing shows. I'm super excited. It's hard to believe it's been more than two months since we've had a show. Be there!